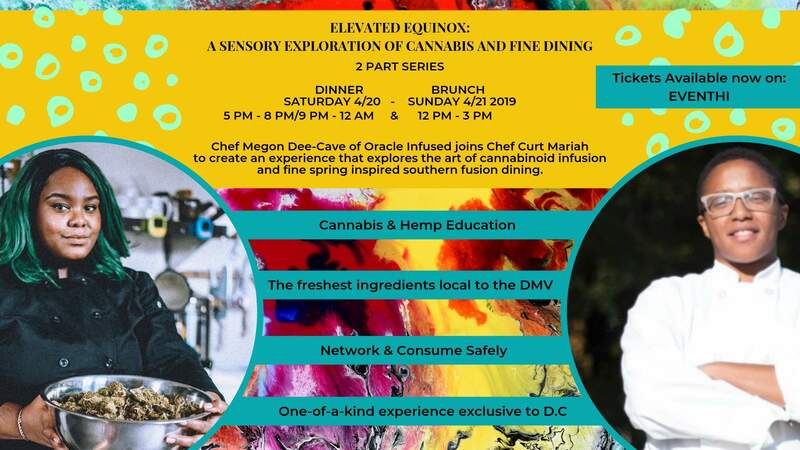 Chef Megon Dee-Cave of Oracle Infused joins the Chef Curt Mariah to create an experience that explores the art of cannabis and fine spring inspired southern fusion dining. Using only the freshest ingredients local to the DMV, you will be indulging in family style Sunday brunch that perfectly blends the flavors, aromas, and intricacies of cannabis and gourmet food. Your palate will be enchanted as each dish expresses unique characteristics that you'd only find in a Michelin star restaurant. This is a alcohol free event. Guest will consume 50 mg of the THC cannabinoid and 25 mg of the CBD cannabinoid. In this state of a comfortable and safe high, guests will utilize all their senses to transcend into their spiritual alter ego so they can experience meaningful and connected relationships with all that is around them, and absorb a deeper capacity to give and receive love with others and oneself in order to thrive spiritually as a collective whole. Please note that this is a low-dose cannabis infused dinner. The event hosts will contact you with further information regarding the evening's delights. Adults 21+ only. The ticket price includes all food, networking, and a one-of-a-kind gourmet experience exclusive to D.C.